Vintage - Royal Stafford Fine Bone China of England - Hand Enameled - Unknown Pattern - Made in the Mid-1950's - Totaling (29) Pieces. 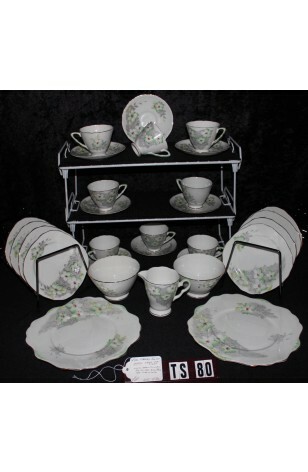 This is a lovely Vintage Bone China Tea Set by Royal Stafford of England. A (29) Piece Set having a Service for Eight. It is a White Background, with Gray Areas on Pieces, holding White and Green Flowers with Hand Enameled Red Centers. Some of the Plates are Slightly Rounded Squares, all are Scalloped, and Trimmed in 2kt Gold on Rims, and Feet. If you are looking for Green, this is a wonderful shade of Green.